Wildlife is a growing concern for homeowners and businesses. Raccoons, Opossums, Squirrels, Skunks, Bats can cause damage to homes and create health risks. 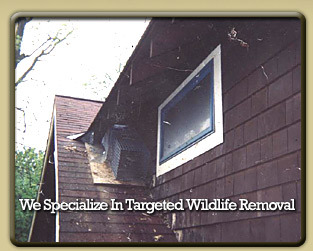 Our process in wildlife control is to remove the animal but also prevent return visits. Inspecting-removing-trapping-cleaning and proofing the effected area. Our trained technicians will professionally remove the wildlife, seal the entry ways and offer a cleanup and decontamination service. The Cleanup service is not required but HIGHLY recommended. Many homes and commercial buildings have had infestation problems for years before calling a professional. Years of feces and body oil can create unpleasant strong odors and health risks, including parasites, insects, fungi, and viruses. The odor can attract other wildlife to the infested areas creating the same problem again and even worsening it.